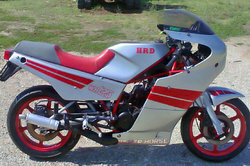 HRD Motor was a motorcycle company based in Busto Arsizio and Luciano Marabese was the ideas person when he founded the company in the '80s. Luciano Marabese was the designer of all the models. The most interesting products were the 125cc road series WH 125 which included the twin Red Horse and White Horse with a 24 hp engine built by TAU, identical in everything except in color,Silver Horse, silver, with engines from 26hp and the formula, a track motorcycle with 32hp. Later they produced the 125WH Road, a tourer, with high handlebars and engine to 22 hp. Produced by craftsmen, a few copies were sold at prices almost twice that of competing brands at the time. 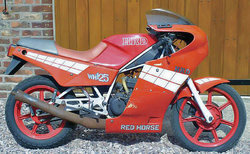 The 125 is remembered that at the time it was "small Bimota" with innovative design and build structure. 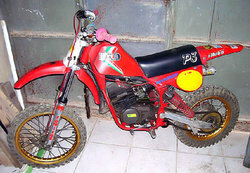 In 1984 and 1985 different models were also tested by the magazine "Motociclismo".